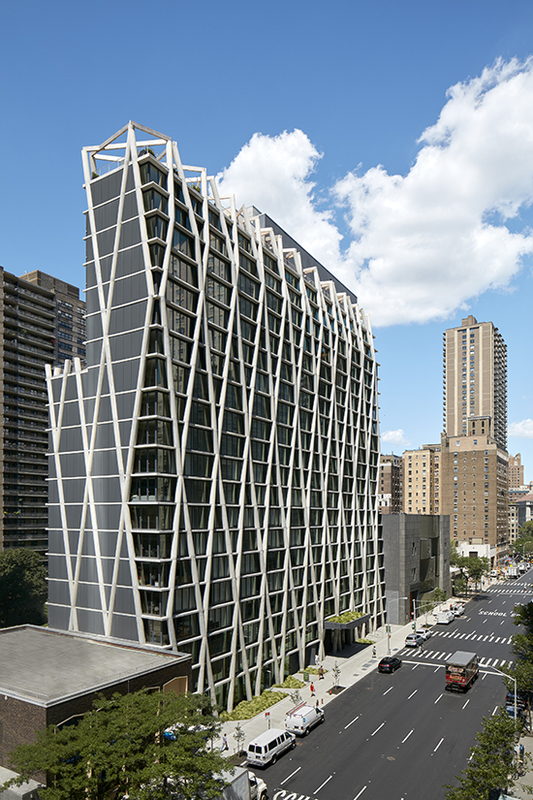 A building on the Upper West Side in New York strikes a unique pose with a cage-like exoskeleton design. 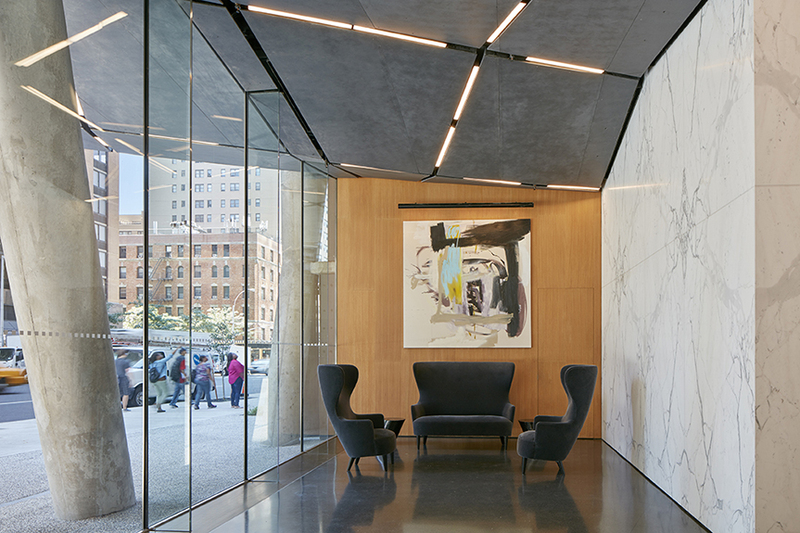 Handel Architects was given the challenge to maximise a long, narrow site at 170 Amsterdam 68th street, where the client did not want a conventional all-glass building desired the benefits of large window without compromising energy efficiency. A concrete exoskeleton encases the 56.5m glass façade, continuing up and over the top floor to produce a canopy for the roof areas. From the interior it may appear as if residents' views would be hindered by the exoskeleton, however speaking with the project's principal-in-charge at Handel Architects, Frank Fusaro, it actually enhances the residents' experience. Looking out from inside it feels as if you're in a treehouse with the giant 'branches' wrapping the edifice, carrying through the interior of the building - piercing the floors and walls of the lobby, common rooms and corridors - and spurting out of the ground. The building resides between Central Park to its east and the landscaped open space of the Lincoln Towers superblocks to the west. The bold structure enriched by the concrete exoskeleton - that appears like limestone - falls into step with the surrounding muscular buildings making up lower Amsterdam Avenue, Lincoln Centre and the Upper West Side. To achieve its limestone appearance the exoskeleton has been crafted with a specialised concrete blend using a dense, high fluid self-consolidating mix that incorporated grey cement and slag to accomplish a light grey finish and meet LEED standards. The formwork to create the criss-crossing, rounded structure involved using an intricate fibreglass system with multiple units that were tightly connected together to attain maximum reuse and economy. The system was designed to allow a pump-placing tube to be inserted into the crosses shapes, meaning the final surface finish was smooth and consistent. A small aggregate mixture enabled the concrete to be placed into the blind areas of the formwork with no vibration. 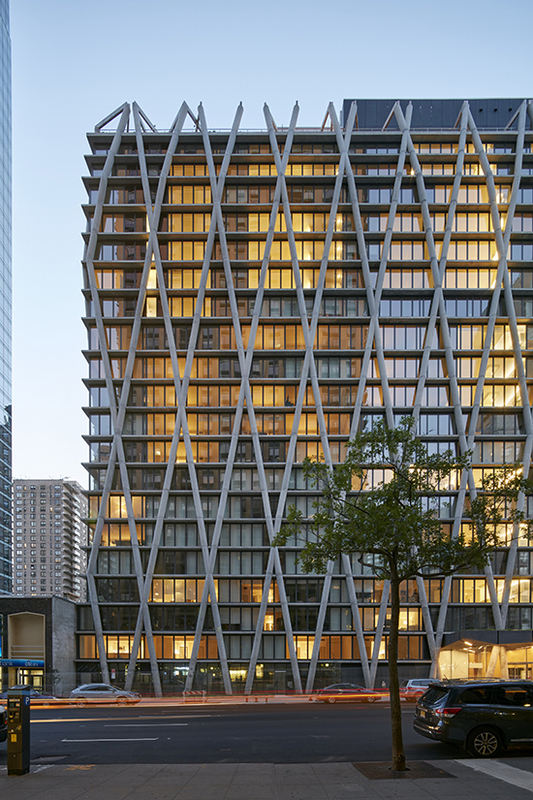 With a nod to the surrounding architecture in the neighbourhood, 170 Amsterdam holds its own as an inimitable and prominent new building on the block.